VIULearn is a learning management system. Some teaching faculty members use it to upload files for you (like your course syllabus or their PowerPoints), create Discussions or Quizzes, and have you upload assignments or view grades. Some teaching faculty members even run fully-online courses in VIULearn. This means that some of your course activities or materials may be online in VIULearn. You can check with your teaching faculty members if you aren’t sure if they are using it or not. If you are feeling nervous about using VIULearn, or just want to practice using the activities before you use them in your courses, you can access a self-paced fully-online orientation course to the VIULearn system free of charge. This course takes about an hour and half to complete if you do everything, but you are not required to finish it. There are 3 steps you need to take to access this course. To create your account you will want to go to the following link: https://entrance.capitan.mala.bc.ca/student/studentaccounts/creaccount.asp. If you have difficulty creating your account contact the VIU IT Helpdesk at ithelp@viu.ca or call 250-740-6300 Monday to Friday 8:00 am to 4:30 pm. To access your online courses and online course material go to: https://learn.viu.ca. Enter your username (student number) and VIU Student Computer Account password (see Step 1). If you have difficulty logging in to VIULearn contact learnsupport@viu.ca or 250-740-6179 Monday to Friday 9:00 am to 4:00 pm. Once you are logged into VIULearn (step 2), click the “Open Learning” link near the top right hand side of your My Home page. Open Learning Link located on the left most portion of the My Home bar, under the blue mini bar. You should see a course called “VIULearn (D2L) Student Orientation” followed by the current year. Select it. The Register button is located in the bottom right corner of the screen, under the description. Your information will automatically populate. Choose “Submit”. The submit button is located in the bottom right corner of the screen, under your first name, last name and email. On the following page choose “Finish”. The finish button is located in the bottom right hand corner of the screen, under your information. 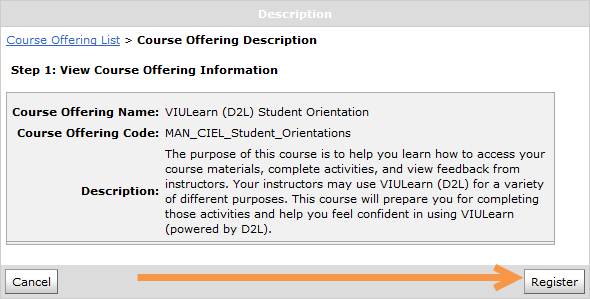 After that, click on “Go to course offering VIULearn (D2L) Student Orientation” to start checking out the course! At the top of the page, there will be a hyperlink to direct you to the course. If you need any assistance with VIULearn you can send an email to learnsupport@viu.ca. If you need assistance with your VIU Student Computer Account you can send an email to ithelp@viu.ca. These emails are monitored 9:00am – 4:00pm Monday to Friday. For assistance with VIULearn, you can also visit https://documentation.desire2learn.com/en/Learning%20Environment.